Workshop turnaround: 5 working days. Call us on 01594 729030 or email info@sprungsuspension.com for more information. Sprung Suspension Workshop is based in the Forest of Dean on the same site as Pedalabikeaway, the main trail centre. Book your service online or over the phone, then you can drop off, pick up or send your suspension in and have it sent back to you if you wish for the ultimate in convenience. What can we work on? 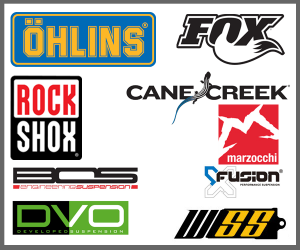 Rockshox, Fox, Ohlins, Cane Creek, BOS, MRP, Marzocchi, X-Fusion, DVO, Avalanche and more. We are also a WSS Service Centre, giving access to Cane Creek upgrades including the piggyback bladder system. We are one of only five Authorised Ohlins Service Centres for Mountain bike in the UK, able to perform servicing and upgrades on Ohlins products, as well as sales.